The Library is a repository for books gathered from different realities. Irene is one of many Librarians, tasked with obtaining rare and unusual books to add to the vast collection. Her latest task has her a bit flummoxed, however. Not only is she saddled with a mentee, Kai, but her new assignment is chock full of intrigue. Can Irene locate the book amidst all the trickery? Genevieve Cogman doesn’t hold back on the action! THE INVISIBLE LIBRARY starts off with a bang and the action doesn’t relent, even as the conspiracies mount up. We’re constantly wondering just who Irene and Kai can trust as even supposed allies appear suspect at times. However, it is the world building that truly makes THE INVISIBLE LIBRARY so astounding. 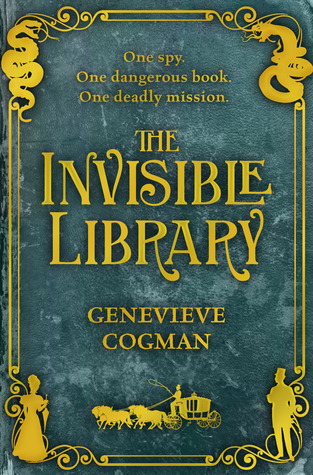 The complexity and depth of the mythology Genevieve Cogman crafts in THE INVISIBLE LIBRARY brings this alternate version of London to vivid life while leaving the reader wanting more. THE INVISIBLE LIBRARY kicks off a new steampunk flavored series that is absolutely amazing! I love Irene’s quest for knowledge and adventure and it’s encouraging to see a strong female heroine in an adventure series. However, I have to admit that Kai stole my heart in THE INVISIBLE LIBRARY. I won’t reveal any spoilers but I look forward to learning more of Kai’s secrets in future installments in the series! Highly recommended!